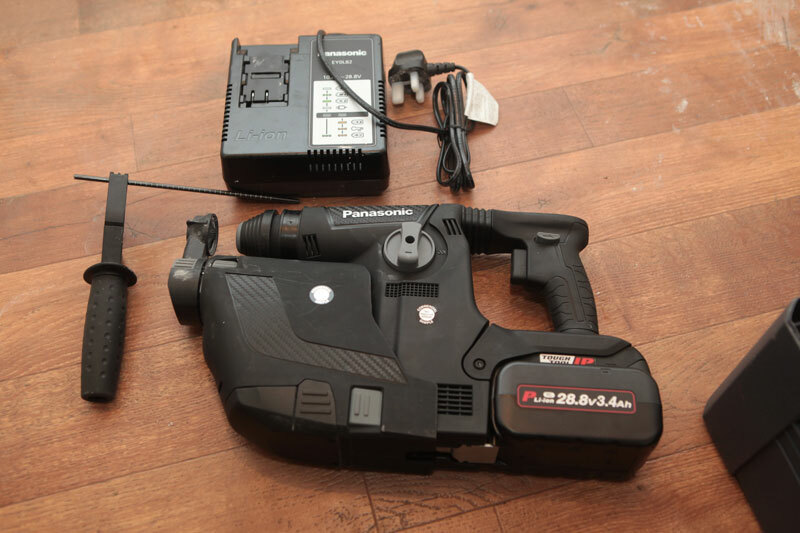 I am a fan of Panasonic drills. You don’t see a huge number around, maybe they are not as obvious as the brighter coloured brands; however when I do come across them the owners are generally quick to sing their praises. They used to make great play of their IP rating for dust and water. I chucked one in a bucket of water once and, after a faltering start it ran perfectly. The 28.8 volt platform is, at present, reserved for the SDS hammers but, interestingly, the batteries that come with this tool are only 3 Ah. While other manufacturers are chasing ever longer run times with larger Ah, Panasonic’s approach is that you can save a bit of weight and bulk with a more powerful cell, and their figures suggest that these cells produce the same Wh as 5Ah 18 volt. Don’t ask me how that works because I was never good at maths. The 3.3 Joules of hammer that are generated by the brushless motor will produce enough punch to cut out socket boxes and take on general lightweight breaking and chipping, even in concrete so plumbers and electricians will love it. The other part of this drill, you will have noticed, is the dust extractor. This clips in and uses power from the drill to run the small motor. It is a highly effective unit and I especially like the brush seal around the vacuum collar. Other manufacturers use a rubber grommet, which wears quickly when drilling concrete and needs replacing fairly often. The brush seems destined to last a bit longer but it is early days and, since this drill has to go back in a few days, I don’t think I will be the one wearing it out. If you are using the drill on rotary stop you will soon discover that there is no switch for hammer only function. Instead Panasonic uses a replacement chuck which misses out the flutes on the SDS that would normally turn the chisel bit. This has the advantage of preventing you putting in a chisel with the rotary action still engaged. In use it is comfortable and not overly heavy at 3.9kg and I really like the vibration damping on the handle. SDS works best when the bit is greased so it slides nicely in the chuck and the operator is not hell bent on forcing the drill through the wall. They are called power tools for a reason and applying too much pressure negates the benefits that come with the vibration damping and also slows the job down. Previous : Incompatible Connector Products: What Are The Dangers?